Click the logo to find other great posts about getting Lucky in Love. It’s no secret that the appeal of romance is the happily ever after—every hero and heroine is lucky in love. They might go through hell to get there, but there they get. I’ve been blessed in my real life to have about as close to a HEA as it gets. This summer, I’ll celebrate my 17th anniversary. And while it hasn’t always been sunshine and roses, nor do I expect to be that way forever, I most definitely got lucky in love with my husband. That rock solid relationship makes it so much more fun to write. What about you? Do you think humor is a key to making relationships work? Leave a comment with your email below to be entered to win great prizes. For the grand prizes, one winner for each will be chosen from comments on all hop participants on March 19th. Swag pack only for U.S. participants. NOTE: Comments must be made by midnight Eastern Time on March 18, 2013! Any comment made after that won’t be eligible for the prize. 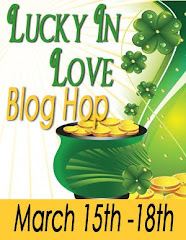 I’ll also be giving away $6 of e-Book Bucks to AllRomance just for those who comment on my post. That excerpt was hot! Would love to read this book! I think humor is absolutely necessary! Happy St. Patrick’s Day and thanks for the amazing giveaway! Humor is a must in a relationship. I think humor is a wonderful bonus to have in a relationship, but it wouldn’t be on my top 5 list of things I require. Humor is like the marshmallow holding the rice krispy treat together! Humor is an absulute MUST! Happy St. Patrick’s Day! Humor’s very important–I definitely need a guy who can make me laugh, and see the lighter side of life! To Hiss or to Kiss is my debut novel. I’ve got two more submitted, so fingers crossed. Good luck to you! I got lucky in love 🙂 I met my husband when i was in high school and we’ve been together for 15 wonderful years! Thanks for the chance to win! LOVE that excerpt!! I love cat shifter books!!! I’ll have to add that to my TBR! !